I love the freedom of this challenge. You get to store whatever tickles your fancy. We have already stored quite a bit of honey, but you don't want to be eating only honey on your bread if you have to rely on your food storage. These spreads go really well with damper or flatbreads if you don't have yeast to be able to make your own bread (as I didn't when I was living on my food storage - now I know you can store yeast in the freezer ;D ). There are some really weird spreads out there too. 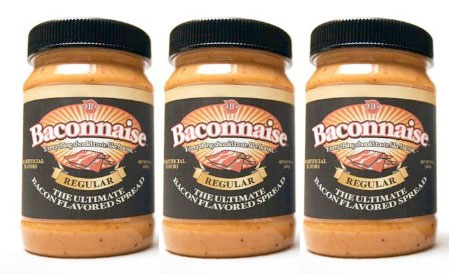 I have to confess that I DO have a strange looking American product called 'Baconnaise". It really is bizarre but tastes oh so good warm cold cooked potatoes and sprinkled with chives when I'm craving something salty. Not telling you to go out and buy it though as mine came with a chocolate offer I just couldn't refuse! It does taste just like bacon flavoured mayonnaise. Two flavours I like very much! I also have assorted mustards in my pantry cupboard as well. Baconnaise...oh my...that's one I'm going to have to try to replicate...yum!